CHICAGO—Clinical investigators from the National Cancer Institute (NCI) announced today at the annual meeting of the American Society of Clinical Oncology (ASCO) that they will begin open patient enrollment in July for the much anticipated Molecular Analysis for Therapy Choice (MATCH) precision medicine trial. The Phase II study will seek to determine if targeted drug therapies for cancers with specific mutational backgrounds will be effective, regardless of the specific cancer type. 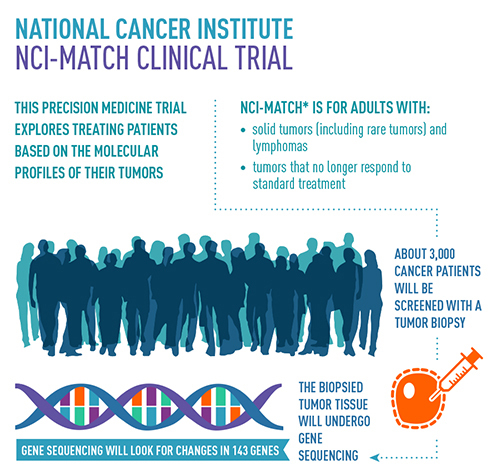 NCI-MATCH will employ 20 different study drugs or drug combinations each of which targets a specific gene mutation—with the intent to match each patient with a specific therapy that targets the molecular mutation specific to their tumor. The study was co-developed by NCI and the ECOG-ACRIN Cancer Research Group, which is part of the NCI-sponsored National Clinical Trials Network (NCTN) and is spearheading the project. The clinical trials will contain a number of substudies for each treatment being investigated, opening with 10 and quickly progressing to 20 substudies within a few months. The first 10 studies will be disseminated through 2,400 participating sites across the US. There are two main enrollment steps for patients to be considered eligible for the trial. Each patient will initially be enrolled for genetic screening, in which samples of their tumor will be biopsied and undergo DNA sequencing. This step is for the detection of genetic abnormalities that may be driving tumor growth and if that tumor can be targeted by one of a wide range of drugs being studied. If a molecular abnormality is detected, for which there is a specific substudy available, patients will be further evaluated to determine if they meet the precise eligibility requirements within that arm to be accepted in NCI-MATCH. This targeted sequencing approach, distinguished by its very low sample requirement and fast turnaround time, will rely on Life Technologies’ Ion Torrent next generation sequencing platform, which can accurately and reliably sequence across a large range of tumor sample types. “A study of this scale would not be feasible using the traditional one-sample, one-biomarker testing approach,” stated Mark Stevenson, executive vice president and president, Life Sciences Solutions, for Thermo Fisher. The NCI-Match study will seek to identify one of the 143 genes associated with cancer that can be targeted by the compounds use in the trial. For quality control all biopsy samples will be sent to one location for processing: the ECOG-ACRIN Central Biorepository and Pathology Facility at the University of Texas MD Anderson Cancer Center in Houston, with DNA analysis being performed at one of four facilities across the US. There are two main clinical endpoints that investigators are looking to gauge in the NCI-MATCH trial. The primary endpoint is the overall response rate, which is the proportion of patients in the trial whose tumors shrink by a predefined amount over a specific time period. The secondary endpoint is 6-month progression-free survival time, which is a measure a patient’s disease stability. To view the NCI-Match Clinical Trial infographic click here.